Our program “Up and Away with Hot Air Balloons” consists of two segments: a photo-illustrated presentation, and a live hot air balloon demonstration. The live demonstration can be accomplished outside, as most people imagine a balloon, or, just as effectively, even inside a building’s gym or multi-purpose room. The heart of our program is an engaging 30-minute presentation. This is illustrated with projected photos, and teaches about how balloons work and what they do. We dispel common misconceptions about ballooning, and we touch on history, science, arts, language, licensing, character, careers and more. Its emphasis can be adjusted to connect with a science or history fair, a reading program, anti-bullying message, or whatever you request. The basic ballooning information remains the same for most everyone, but the delivery, specific content and time frame may change based on age-level, interest, attention-span of the audience, and based on what message you would like to communicate. From the presentation, adults as well as students will be amazed at how much they learn. This is what most people think of when they imagine a balloon coming to school. If you wish, and if the weather permits, we may be able to inflate the balloon on a ball field or in the schoolyard. Once the balloon is inflated and upright, if the wind is calm enough, we might even be able to give a few rides up and down on a tether. (We keep the balloon tied with ropes so the wind will not carry it away.) 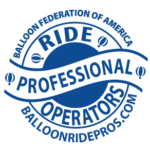 This demonstration is a hands-on opportunity, and often parents and staff enjoy assisting with balloon operations. The full outdoor demonstration takes about 45 minutes. If you prefer, we can give an equally exciting (and even more educational) demonstration inside a gymnasium, cafeteria, multi-purpose room…or whatever facility you have. This demonstration is also our backup when weather prohibits operations outdoors. It typically takes 30 minutes to accomplish. For safety, we leave the basket with its propane fuel outside (see our video of a basket demo); we then inflate the balloon inside, using electric fans. We tell the students that of course we can’t fly inside, but that we want to inflate the balloon; and we tell them that “the word ‘inflate’ means we fill the balloon with air; then, we are going to fill it…with…kids!” Imagine students’ excitement as they enter inside a massive, beautiful, airworthy hot air balloon. While inside, we encounter several teachable moments with the students, of which we take full advantage. For this portion, we are able to comfortably contain multiple classes within the balloon at one time. The excitement generated by the powerful double burner system is unparalleled! This portion of the program typically will be included (barring really inclement weather) as an extension of the indoor program. However, if the wind is too strong to stand the balloon up and give rides, we often invite the students to join us for a close-up look at the basket and burners as part of the outdoor demonstration as well. We typically allow 15 minutes for the basket demonstration. Ready for a personal conversation? We’re glad to discuss the program with you! We understand every school and every schedule is different; so to explore options for how this program can be custom-built to fit your school’s needs, please contact us.